Just removed from the height of the Cold War with tensions between the United States and Russia still at its peak, the U.S. discovers an aquatic creature the Ruskies would love to get their hands on. Unearthed from the muddy waters of South America where it was revered as a God, this amphibian man (Doug Jones) is now under the U.S. government microscope as the military tries to understand how it functions. A mute cleaning lady Elisa (Sally Hawkins) forms an unlikely bond with the aquatic creature with manlike features. The two grow closer as government testing becomes deadlier, forcing a forgotten servant to decide if her quiet, routine life is worth risking for someone, or something she loves. An excellent cast delivers extraordinary performances, led by the award worthy Sally Hawkins who amazes each time she’s on screen. She’s fearless as the mute Elisa Esposito whom I fell in love with on-screen. Hawkins captures the wonderment Elisa has for her routine life then adds excitement as she grows to love. All of this is felt by the viewer without a word spoken. Though del Toro tells us what’s in Elisa’s heart, you can see it just as clear simply by looking in Sally Hawkins eyes. Amazing. Hawkins is aided with a supporting cast that impresses. Her on-screen best friend is Giles (Richard Jenkins), a gay man in a time when it wasn’t acceptable to be homosexual. The relationship between a hidden homosexual and an incomplete mute is where the heart and magic of the pairing is. They accept each other when no one else accepts them. Elisa’s only other friend Zelda (Octavia Spencer) is unfortunately a little too stereotypical loud, black woman of the sixties, complaining about her husband. I did give a chuckle when their boss Richard Strickland (Michael Shannon) referred to them as The Help. Michael Shannon layers his “bad guy” role with a villain you will feel remorse for. To an even further extent Michael Stuhlberg will make you a communist sympathizer. Though it’s not easy to tell what is acting and what is animated behind the modern day Gillman, the Amphibian Man himself Doug Jones always fits this role nicely and deserves mentioning. Director Guillermo del Toro finally brings his longstanding labor of love to the big screen in what he himself calls one of his best movies. 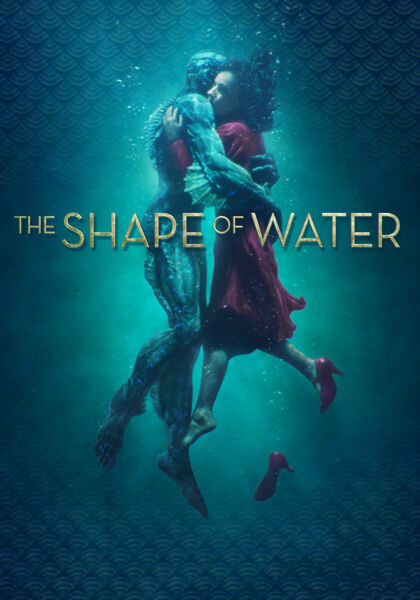 The Shape of Water is a work of art in feature film form. del Toro paints a complete picture without coloring outside of the lines, leaving little to the imagination and less that’s unexpected. This may not be enough for some who need to question and figure it out for themselves to feel fulfilled but a beautiful work of art is still beautiful even if it’s not abstract for the pretentious. Guillermo del Toro has found a masterpiece in the form of an interspecies love story. This creature feature stands on its on two webbed feet as a modern day version of misunderstood monster who can love like Frankenstein, The Creature from the Black Lagoon and King Kong. del Toro paints a beautiful world set in 1964 America. He’s able to do what so many movies fail at, transporting the viewer through time. We’re even briefly transported back to the Golden Age of Hollywood as we watch the Silver Screen. A wonderful score helps to capture magic. When the movie ended I did not want to return to reality. There’s no greater compliment I can give a film. I simply loved it.